Get ready to experience brutal, colosseum-based combat in Dorado Games’ new title, Death Before Dishonor. 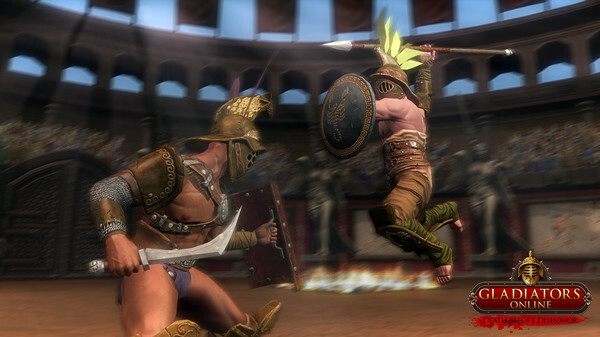 A violent game featuring real-time combat with gladiators. Players will be able to utilize anything from swords, shields, tridents, and more to bash and skewer their opponents in intense nail-biting fights to the death. The team behind Death Before Dishonor are gaming industry veterans who have worked on games such as Battlefield, Civilization, and Wolfenstein. They have crafted a special combat system specifically for their new game in order to keep players on their toes. The combat system in Death Before Dishonor lets players control a gladiator of their choosing and pits them against other players in a fight to claim victory. The losing player’s gladiator will permanently disappear from their gladiator roster. Obviously, this is something no player wants to have happen. So it’s up to them to not only keep their gladiators equipped with the best possible armor and abilities, but to keep their own skills at their absolute best as well. Death Before Dishonor is all about preparation, and only the best-equipped players with the best fighting skills will be able to live to fight another day. When players aren’t disemboweling or beheading their opponents in the arena, they’ll be able to step into the shoes of a gladiatorial school owner and will be able to purchase any fighters they can afford. You won’t be able to select any fighter you want right off the bat. The game will feature an auction system which will have players dynamically bidding for fighters against other players. Once your purchase has been completed, you can equip your fighter with weapons, armor, and train them for their upcoming fights. What you do with your gladiator determines whether or not you will claim victory. Remember, once your fighter dies, they’re gone for good. So make sure you invest well in your top fighters. If your fighter gets injured, you’ll be able to hire staff such as Doctors and Courtesans to ensure your fighters stay in the best shape possible. The game has four gladiator class types, the first one being Murmillo, an archetypical gladiator that's heavily armored and has great defensive combat skills. He fights with a gladius short sword for offense, and wields a large shield for defense. The second class is Hoplomachus, a medium armored combatant who uses a lance and round shield in combat. The third class is Thraex, a brutal fighter who uses rectangular shields and prefers to use curved swords during combat. The Tharex class is typically medium armored like the Hoplomachus class. The last class is Retiarius, who prefer to go into combat with light armor and some additional shoulder armor. They don't utilize any sort of defensive shields and prefer to rely on their tridents and fishermen nets to take their opponents down. Death Before Dishonor is not only free-to-play, but free to win as well. The developers have aimed to make sure every single player will experience the same fair combat system and in-game progression. It doesn’t matter if you pay money in-game, it won’t advance you any further than a player that did not. The in-game premium packages are specifically designed to save players time and in-game currency without causing the game to tilt towards another player’s favor. The game also features over 60 different combat skills and over 600 items for players to acquire. If you have Steam, make sure you give the game a try here. Nauglamir, LookBroZombies_XBL and Aydind like this.